Dry Christmas Trees Can be a DISASTER! The Triangle Shirtwaist Factory Fire occurred on March 25, 1911. Located in the Asch Building at the corner of Washington Place and Greene Street, 146 garment workers died – 123 women and 23 men. They died from fire, smoke inhalation, falling, or jumping to their deaths. 62 souls jumped or fell to their death in their struggle to escape the ravages of fire. The building owners, Max Blanck and Isaac Harris survived. The doors to the stairwells were locked to prevent theft and workers leaving early. Housekeeping was atrocious. Linen scraps accumulated and filled the space under the tables; the scraps were not removed regularly – only when they could fit no more. There were no fire drills. There were no safety training sessions offered to employees. Most of the workers were immigrants, and most probably did not know about fire safety and proper evacuation. The Asch Building was a commercial high rise building with other companies occupying lower floors. On the ninth floor, there were 278 sewing machines. Eight rows of machines running south to north, parallel to the Greene Street windows. Every row went right up to the Washington Street windows where the electrical power drove the machine drive shafts. Space was money – there was no free space on the floor. The number of workers in attendance on that Sabbath day is unclear, perhaps 250, mostly women and about three dozen men. Just imagine the crowded conditions, rows and rows of sewing machines, all lined up, one after another. On the eighth floor, a fire started in the cutting table area. The fire quickly traveled to the ninth floor. The building airshaft quickly funneled the flames upward and into the upper floor windows. Women were stacked up against the Greene Street door, unable to pass through the locked door. Across the floor, the Washington Street door was also locked shut. Finally they were able to get through the Greene Street door and many headed to the roof. Those on the ninth floor had to run through a wall of fire to get through the Greene Street Door. Those who hesitated and did not run through the fire perished. The fire escape was of poor design and installation. The landings were improper. The ladders were too narrow. Window shutters opened outward and blocked the fire escape unless they were carefully folded back and positively hooked back against the wall. During construction the fire marshal identified flaws in the design and the architect promised to redesign the fire escape, but never did. The fire marshal and city inspectors never followed up, and the poor design was installed. With the weight of so many people, the fire escape pulled loose and collapsed, hurling many to their death. Mr. Daniel Donahue, the chief dispatcher on duty was at the fire headquarters when box 289 was pulled at 4:45 pm. He noted the call was answered by many neighborhood fire stations. He noted the barrage of phone calls reporting the fire and the repeated pulls of the factory’s private fire alarm box. There was another fire in the neighborhood, but there was still adequate equipment and men to respond to the fire at the Asch Building. Engine Co. 72 was the first of eight wagons to immediate respond to the alarm within 90 seconds of the alarm. Engine Co. 18 with Captain Howard Ruch in command arrived within two minutes into Waverly Place from Greenwich Avenue. Captain Ruch looked up to see workers filling the windows of the ninth floor – people screaming for help! One particular shriek caught his attention, “I heard a shriek, and saw the people start to jump. And I ran to the apparatus and ordered the life net to the street.” Afterward, no one recalled a single person being saved by the nets. Less than five minutes – probably more like about three minutes, was all the workers had to escape, jump, or die. It is said that cotton linen will burn explosively, quicker than paper. Add to that the lint, threads, and fibers which may have floated to land upon the upper fixtures as light as dust. Such light materials will ignite in a fireball, which is what the fire was like. In the end, 146 garment workers died – 123 women and 23 men. 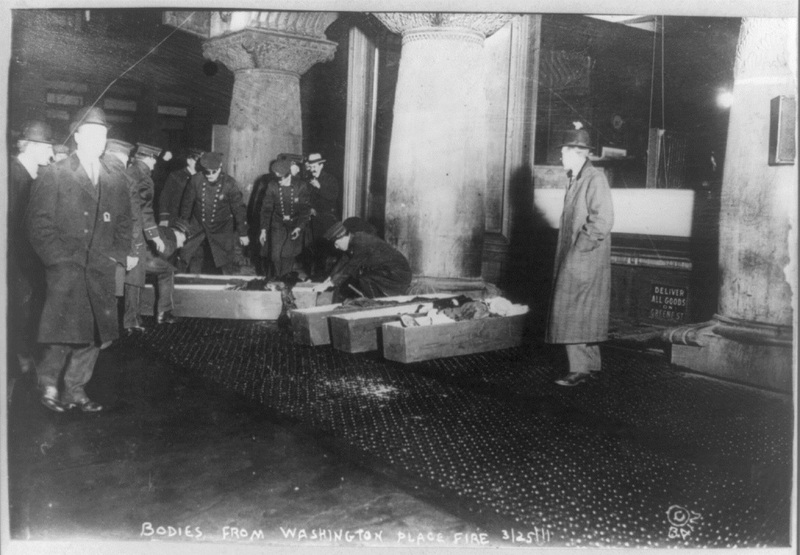 Max Blanck and Isaac Harris stood trial for intentionally locking the doors and causing the deaths and injuries. The verdict vote was 8 to acquit, 2 to convict, and 2 abstains. Blanck and Harris’ company followed a decline after the fire, going into oblivion by the end of World War I. The International Ladies’ Garment Workers’ Union became stronger and worked for more worker protections. In the end, the International Ladies’ Garment Workers’ Union purchased the headquarters of their old political foes, buying the headquarters building of Tammany Hall in August 1943. Today, we should remember the senseless loss of those 146 lives, six of which are still unnamed. Also, the survivors for the memories they carried for the rest of their lives. The firefighters, who tried in vain to save those souls, but were unable. To the families of the victims, who carried on with a void in their hearts. A very good book of the Triangle Shirtwaist Factory Fire (from which the information for this post was derived) is “TRIANGLE The Fire That Changed America” : Von Drehle, David. TRIANGLE The Fire That Changed America. New York, NY: Grove Press, 2003. This entry was posted on Tuesday, March 25th, 2014 at 5:02 pm and is filed under Uncategorized. You can follow any responses to this entry through the RSS 2.0 feed. You can leave a response, or trackback from your own site. Beattie Fire Protection & Risk Consulting, LLC is no longer offering fire protection consulting services. Thank you for your patronage and support over the years.